For some background on what units are, including how to use units and how to think about them in physical and algebraic terms, see reference 1. A dimension describes the type of thing being measured, without specifying the magnitude. The inch and the foot both have dimensions of length. A unit has a definite magnitude, and can be used as a basis for measuring other things. The inch is a unit. The foot is a different unit, because it has a different magnitude. As indicated by the Venn diagram in figure 1, if you know the units, you know the dimensions, but not vice versa. There are many different units for the same dimensions. The meter is the SI base unit for length, as indicated by the double outline, but it is not the only possible unit. Although people commonly think of mass, length, and time as being “the” basic dimensions, this entails considerable arbitrariness. In relativity, for instance, length and time are considered dimensionally the same, and are even measured in the same units sometimes (but sometimes not). radian, steradian, degree, minute, second, grad. X or -fold (as in 3X or 3-fold magnification). bel (as in decibel, measuring a ratio), neper. The name “perun” is short for Latin per unum, just as “percent” is short for per centum. One perun is equal to 100 percent. The name “mach” is typically used in front of the number, as in “mach 12” (rather than 12 mach), which is highly irregular. Reynolds number, Nusselt number, Prandtl number, et cetera. One wonders why the items on the second list don’t have names. Part of the reason may be that they represent a well-established, convenient-sized unit. In contrast, if you ever get a situation where there are contending units (e.g. Bel versus neper) somebody will coin names for the various contenders. Also when units have an inconvenient size, somebody will coin a name just so we can hang metric prefixes on it (e.g. milliradian). In relativity, the unit of rapidity is usually nameless, although one could argue that the conventional unit is conceptually equivalent to a radian, since a boost is just a rotation in a timelike direction. A nanoradian of boost corresponds to roughly one foot per second of speed. The most conspicuous offset scale is the Celsius temperature scale, which differs from the Kelvin temperature scale by an additive offset, and differs from the Fahrenheit scale by both a multiplicative factor and an additive offset. Knowing the size of the unit does not suffice to fully describe the scale. John Gastineau reports seeing a curling iron with a button that temporarily makes the iron hotter. The packaging stated that pressing the button will “increase the temperature by 20 C (or 68 F)”. Oops. As another example, you can measure altitude relative to the center of the earth, relative to mean sea level, and/or relative to the floor of the laboratory. You can use the same unit in each case. Knowing the unit does not fully describe the measurement; you also need to know the frame of reference. Similar examples abound. There’s more to physics than units. Earthquakes, measured in Richter numbers. Electromagnetic power, measured in dBm. Proton concentration, measured in pH units. A measurement denominated in dBm contains both a multiplicative unit (setting the decibel apart from a whole Bel) and an additive dimension (specifying the reference level as one milliwatt). The additive part is essentially the logarithm of the reference level (using in this case logarithms to the base tenth-root-of-ten). Shifting the reference level from milliwatts to watts causes an additive (not multiplicative) change in the reported number: 13dBW equals 43dBm, i.e. 30dB more power than 13dBm. Similarly, a measurement denominated in pH implicitly contains an additive dimension, essentially the negative logarithm of one mole per liter. This does not multiply the 7 in pH 7; it just adds to it. When you exponentiate the combination, you get a concentration with the correct units. 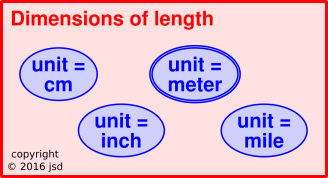 There exist other measurement schemes that are so complicated that the very idea of units of measurement breaks down. It’s hard to assign units to a sample of a signal that uses mu-law encoding. It’s just too nonlinear. Mu-law is not a measurement unit, it’s a measurement scheme. Knowing that something is dimensionless doesn’t tell you everything you need to know. There’s more to physics than dimensional analysis, and there’s more to dimensional analysis than recognizing dimensional groups. Usually you care more about the scaling behavior than the dimensions per se. The dimensions often allow you to make a good guess as to what the scaling law will be, but this is not foolproof. Please see reference 3 for a discussion of dimensional analysis, its connection to scaling laws, and its limitations. All notions of units and dimensions rest on deeper notions of scaling, as discussed in reference 4. There are no uniquely special "natural" units. We choose units that are conventional and/or convenient. The choice depends on context: units that are convenient in one situation may be inconvenient in another situation. For example, radians are not the only natural unit for angles. Measuring rotations in cycles is also natural, logical, and (in some situations) convenient and conventional. In trigonometry class and calculus class radians are conventional, while in various technological fields cycles are conventional. Some formulas are simpler when expressed in radians, while other formulas are simpler when expressed in cycles. If you take the SI definitions literally, a mole is not dimensionless, but has dimensions of its own, namely “amount of substance”. (By way of analogy, "luminous intensity" is another such SI-defined dimension. See reference 2.) However, it is not necessary to take SI so literally. Just as it is often fruitful to re-interpret luminous intensity in terms of simpler SI dimensions of time, length, and mass, so it is often fruitful to re-interpret the mole as a dimensionless unit, just like a "dozen", except larger.